WilsonPro PRO 70 Commercial Building Cellular Repeater System provides up to 15,000 sq feet of improved cellular signal inside a building. The Pro 70 is a professional grade in-building cellular & 4G signal booster system. The Pro 70 offers larger in-building coverage area. The Pro 70 Series amplifies weak cellular signals and redistributes the signals to cover larger indoor spaces. It does this for reliable voice and data service - including 4G LTE - inside homes and other buildings where signals blocked by concrete, steel, and other materials. Like all of WilsoPro 4G products, these boosters support all bands and major carriers in the United States. These professional-grade kits feature N-type connectors and Wilson400 coaxial cable and include an industry-leading three-year warranty. Feel free to Contact Us for help, to purchase or to get a free quote for additional custom configuration options. We would be happy to help you design the best system for your installation. The WilsonPro Pro 70 covers all carriers in the United States using 800MHz and 1900MHz for phone calls as well as 3G Internet. It also covers most 4G frequencies. 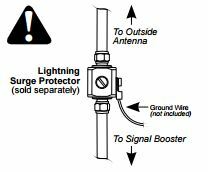 Install the 50 OHM lightning surge protector (LSP) close to the Signal Booster Amplifier. Attach the cable from the outside antenna to the surge protector. Ensure the LSP is properly grounded according to your local building codes.